So this week I wanted a circuit I could either do I. It’s entirety or one I could do bits of to fit around the day. With a baby and toddler you never know how much time you are gonna get and righ now I would rather succeed in my goals than fail and give up. 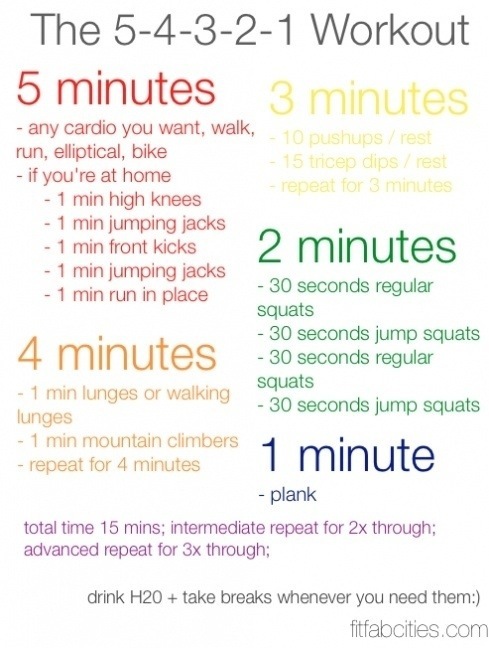 So far my goals this week are 1 x20 mins swim, a 20 run outside and one on the treadmill and then a part of this circuit everyday- whether it’s the whole 15 mins or just the 1 min plank. I did my swim this morning in the glorious sunshine and it motivated me to do an extra 10 mins. So 30 mins freestyle swim is ticked off this week. Make your goals really specific, what day you will do it, what time, for how long and make sure you make your goals achievable. If you say you will run every day and you haven’t run for years, it will seem daunting. If you say I will go out for a run/walk once this week- on Wednesday morning, for 10 mins, it is more likely you will do it. Achieving a goal makes you motivated to set more goals, you might even do it for longer, or again in the week- there’s no better feeling than smashing a target! Above all else make sure it’s something you enjoy- if your goal is to go for a walk, put on music you want to sing along to- one of the great things I love about outdoor running is you can sing along or do what I like to call dance running- if anyone sees you it doesn’t matter you’ve gone past them already anyway!!!! « Exercising Post Natal: Abs check.